Aphrodite Hills, Kouklia – Situated on the very popular Helios Heights Village surrounded by magnificent scenery, this delightful two bedroom two bathroom ground floor apartment for sale in Aphrodite Hills is available for sale at a competitive price. Located almost at the waters edge of the lower pool this would be a delightful property for any family. The manageable garden is laid to lawn at the rear, with an enclosed lawned garden at the front, and has ample space for sun beds and dining table and chairs on the covered patio. You will feel like you have your own yard with lawn. The apartment has two good sized bedrooms with patio doors leading to the rear terrace, one with twin beds and both with en-suite facilities and fitted wardrobes. The living/dining area is open plan and has patio doors, facing the pool. A delightful property and viewing is recommended. Aphrodite hills is the most popular golf destination in Paphos, Cyprus. 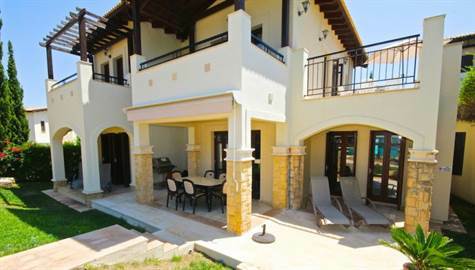 Only minutes from the Paphos International Airport the community offer much more than golf. The village square has a variety of restaurants, award winning spa, tennis courts, horse back riding as well as some of the best views of the Mediterranean sea. If you are thinking of buying in Cyprus and wish to live an active lifestyle and truly enjoy nature and the great weather then this is a property worth looking at.